The Sitka School Board stopped worrying about education funding for about an hour Wednesday evening (5-17-17) — to make stuff. The board convened in a work session for a hands-on presentation on the district’s mobile makerspace cart, which just completed its first year of testing in elementary classrooms. School board members Jenn McNichol and Eric VanCise are transforming a banana into a piano keyboard. Member Dionne Brady is sketching a birthday cake on a piece of paper, and she clips a wire to her drawing. The wires and the pencil lead complete an electrical circuit — which is totally old school — but the circuit runs through a laptop which recognizes Brady’s drawing, and plays the tune. 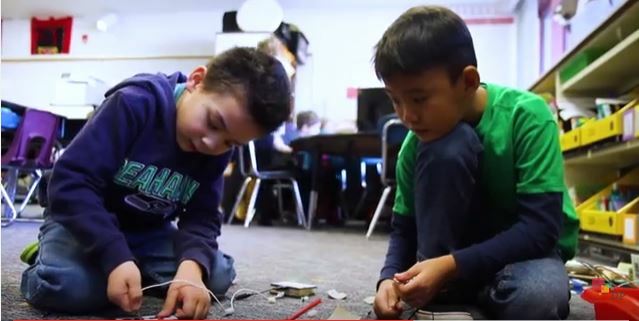 The advocates for makerspace say that students quickly move through this initial — and slightly annoying — phase and find completely unexpected ways to use the collection of wires, gizmos, and software that travels around the district in a large red cabinet. Cindy Duncan is a 2nd grade teacher at Keet Gooshi Heen. She told the board that students in her classroom created a language assist tool for a fellow student with disabilities. As part of a pilot program with the League of Innovative Schools, Duncan received laptops, large screens, and a 3D printer and scanner for her classroom. She used “maker mornings” to research the effect of the program on attendance for her Masters’ thesis, and she said that it was significant. The mobile makerspace cart was managed last year by Soshi Bieler, with the Sitka Fellows program. 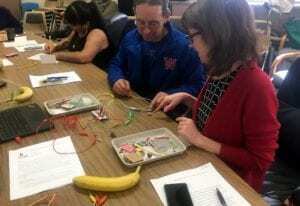 But it’s the brainchild of superintendent Mary Wegner and her longtime mentor in technological education, Jason Ohler, who’s been studying the makerspace movement. He presented a lengthy report to the school board. He said that in recent years schools have been focused on teaching software — spreadsheets and word processing — but that is changing. Ohler speaks passionately about makerspace. Ohler started the Masters in Education Technology degree program at the University of Alaska Southeast, and Sitka superintendent Mary Wegner was one of his students. Now she teaches a digital leadership and technology class at the university for school administrators earning their superintendent’s endorsement. Her fee — about $4,500 — covers the lion’s share of funding for the makerspace program in the district, and for Ohler’s travel expenses. So it’s not a ton of money, but even with board support will makerspace stick? This is not Ohler’s first time down a path toward an uncertain future. The use of the mobile makerspace cart in Sitka was open-ended in the last school year, and experimental. Next year the cart will move permanently to Pacific High, and Baranof, Keet, and Blatchley will get slightly scaled-down carts, and teachers will begin to integrate makerspace into the curriculum — as is already being done in Sitka High’s digital fabrication lab and career education facilities, which serve as one huge makerspace. For students — and whatever comes next.